This year’s Xerox Rochester International Jazz Festival celebrated its 17th anniversary with attendance of over 208,000 people, who flocked to nine days of performances by artists such as Seal, Boz Scaggs, Alison Krauss, Brian Setzer and Tower of Power. The festival, which ran from June 22 through June 30, included the Avangrid Foundation/RG&E Barclay Damon Fusion Stage, hosting shows by regional artists and powered by QSC, including K.2 and KW Series powered loudspeakers, KW181 active subwoofers, and a TouchMix-30 Pro Compact Digital Mixer. "The QSC system did an amazing job in the tent. It was very musical and had great coverage," said Sebastian Marino, Audio Images owner and president/CEO. Front-of-house engineer Joe Barnes said, "I've had various systems in this tent over the years and this was the best it has sounded. The bass was tight, the vocals were very natural, and the top end was extremely well defined. 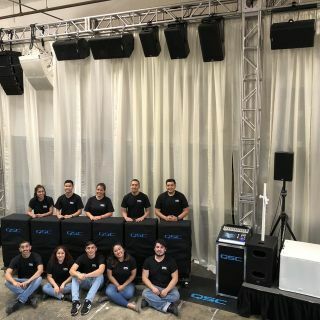 This tent is not the easiest environment for audio but the K.2 and KWs, combined with the features of the TouchMix-30 Pro, made getting a great sounding mix quick and easy."